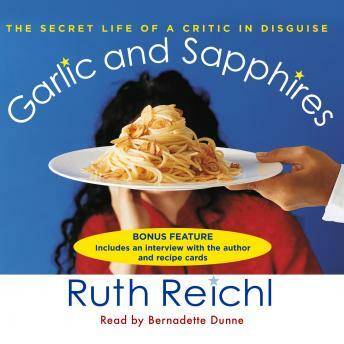 Listen to "Garlic and Sapphires: The Secret Life of a Critic in Disguise" on your iOS and Android device. As she writes, "Every restaurant is a theater . . . even the modest restaurants offer the opportunity to become someone else, at least for a little while." GARLIC AND SAPPHIRES is a reflection on personal identity and role playing in the decadent, epicurean theaters of the restaurant world. I wouldn't call this book groundbreaking, But it keeps you interested and has a nice ending. Worth the read. I found Garlic and Sapphires to be very enjoyable. I am fascinated by how Ruth's critic disguises were portrayed as her alter egos. At first it was difficult to get past the character voices - but I soon fell into the rhythm and especially enjoyed Miriam. The Good: Ruth Reichl genuinely loves food, and you can tell she really enjoyed the puckishness of dressing up and getting one over on snooty restaurant owners. It was fun to hear her describe her adventures in wig-purchasing and deception. It was very cool that she busted out some of the restaurants in NY for treating "the little people" with terrible service. The Bad: Especially after the third or fourth costume change, the book got a little self-indulgent, and became more about Ruth Reichl finding her inner child than the fun tone of the earlier book. I really don't care whether she was happy in her job, why she left to go edit Gourmet magazine, or even that she left at all. Basically, she spent the last 25% of the book justifying a decision she obviously felt guilty for. I wanted more shenanigans in restaurants, and could have done without the confessional. My advice? Read / listen to the book, skim the end. I'm not sure how the author made her living as a writer. It's as if her 9th grade English teacher told her that it was a good idea to use LOTS of adjectives everywhere. It became comical after a while to see if she could right a straightforward sentence without over modifying. It never happened. While the premise of the book is interesting -- why someone would have to use disguises to write restaurant reviews -- it quickly wore thin. It was a huge mistake to have the author narrate. Her voice grates on the nerves, especially when she tries to act out her other characters. Basically this is a forgettable book, one I do not recommend. This book was really fun and interesting! The author's voice got on my nerves a bit, but her story was worth ignoring the vocal tone. nice! This reading contains multiple real life experiences that are narrated by a food critic of the New York Times. The author provides vivid detail in a pleasant style and uses the backdrop of the newspaper inner world to create an interesting setting. The story poignantly blends humor and real life experience as the adventures in the restaurant industry unfold. The question/answer epilogue at the end is an added plus. If you are a foodie or have dined in some of NYC's best restaurants, a fun and quick read. I enjoyed it. Good read especially if you frequent the restaurants of New York.The subject matter and the author are very likable. An entertaining, fun look at the world of wining & dining. The story didn't go anywhere though, and by Ruth's 3rd or 4th character I had had enough. I'm not a "foodie", so my enjoyment of this book was a wonderful surprise. She writes well, and it was VERY entertaining. I hated to see it end!